Our summer internship program offers an opportunity to learn valuable skills at a successful coastal nonprofit organization. Interns will also learn about the inner workings of nonprofit management, including public relations, strategic planning, marketing, board of directors management, communications, fundraising and nonprofit governance. Be an integral part of our team. This hands-on program introduces participants to local, state and national coastal policy and management. It also provides outdoor opportunities in habitat and water quality restoration. Whether it’s planting a living shoreline, bagging oyster shells for habitat or building a rain garden to reduce polluted stormwater runoff, the mix of field and research based opportunities provides a multitude of memorable experiences. A key part of our internship includes guest presentations and site visits with local, state and federal officials; private industry; other nonprofits and academia such as three local university marine labs and a National Oceanic and Atmospheric Administration facility. Learn about important coastal environmental issues and the key priority goals of the Coastal Federation. Better understand coastal management policy and implementation at the federal, state and local levels and apply research skills to timely coastal issues. Learn about the roles of science, law, politics and media relations in coastal advocacy, effective public participation models and engagement strategies and apply research skills to timely coastal issues. Experience the natural coast and understand the Coastal Federation’s protection and restoration work by engaging in a variety of field projects and site visits. Learn key steps for managing and operating a nonprofit (membership and board development, use of volunteers, staffing, accounting, grant writing and communications). Collaborate on key coastal issues to help advance the work of the Coastal Federation by working with fellow interns on group assignments. 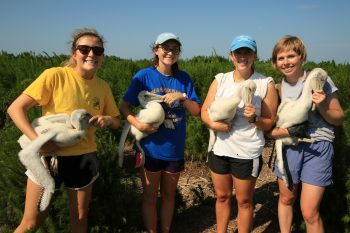 The 2016 interns had the opportunity to spend a day on New Dump Island banding baby brown pelicans. The bands will provide information on things such as migration, breeding age and population trends — information that helps protect brown pelican populations. The federation is proud to have been chosen to participate in the Stanback Internship Program since its inception. We invite Duke graduate and undergraduate students with an interest in environmental protection, advocacy and restoration to apply. The projects that interns work on change by the summer, but you can get an idea about what a day-by-day schedule looks like here. To apply, please review our website to learn more about our ongoing work, and then email a cover letter and a resume to Ana Zivanovic-Nenadovic. In the cover letter please outline your skills and abilities, your interest in restoration, advocacy and/or education and the types of projects that interest you. This internship will take place at our Central office in Newport, NC.